A Large Synoptic Survey Telescope is a telescope with an 8.4 metre convex mirror, the largest ever built, which reached its final design stage (July 2012) and is to be built not far from the Gemini South and SOAR telescopes on the Cerro Pachón site in the Chilean mountains at an altitude of 2,680 m. It should achieve first lights (the moment it receives its first image) seven years and three months after construction starts. The main fields of research of the LSST will be dark matter, the solar system, occultations, mapping galaxies and moving objects. 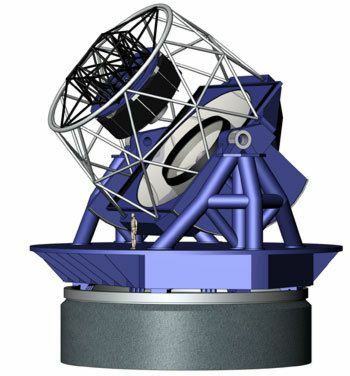 The Large Synoptic Survey Telescope will photograph the region of the sky being surveyed every 3 days, producing 30 terabytes of data per night using a three billion pixel CCD camera. It will be able to take photos every 10 seconds, laying the foundations for a new way of working by providing a sort of film of astronomical events as they evolve and move quickly on the scale of the universe. It has therefore been designed to observe and better understand supernovae, asteroids close to the Earth, and objects in the Kuiper belt. The possibilities are enormous. Thus it will be able to detect moving objects of about 100 m in size that might be a threat to our planet.